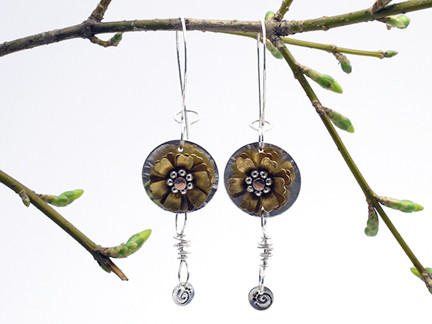 I wanted to make some fun and unique earrings for a friend for Christmas, ones that incorporated mixed metals and flowers–and these pretty riveted earrings by Karen Dougherty immediately came to mind. Karen designed these earrings using cold connections especially for Jewelry Making Daily readers, to celebrate her book Metal Style: 20 Jewelry Designs with Cold Join Techniques. 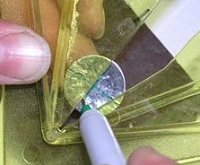 Karen defines cold connections as the joining of materials without the use of solder or flame, but cold connections aren’t just an alternative for jewelry makers who don’t want to use a torch. “No heat means more design possibilities,” Karen says, because cold connections allow the joining of materials that might not be able to withstand the heat of soldering. That means you can combine materials like plastics, rubber, fabric, ribbon, softer metals with different melting points, and more. What no-heat materials will you add to these earrings to make them your own? 1. 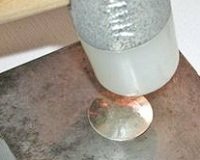 Place one 3/4″ diameter sterling disc right side up on a smooth stainless steel surface. Texture using sharper edge of your texturing hammer. I used a two-headed Fretz raising hammer. Move the disc around in a circular pattern while you hammer. Tap the surface from the center outwards, in a downward and outward swiping/tapping motion. Note: Your piece of silver will become a little distorted. Simply flip it over and tap on the reverse side to flatten. Be careful not to tap too hard or you’ll distort the pretty texture you just created. 3. 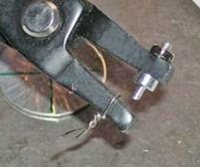 Punch the center hole with the 1.8mm hole-punching pliers. Line up the punch and view the placement from as many angles as possible to make sure you have the center. Even if you’re off a small bit, it will be obvious when you rivet your pieces together. It’s imperative that your rivet wire is a tight fit for this hole. You’ll have to ream out the hole with a bead reamer or round needle file. Tap your disc with a nylon hammer to flatten any curves that form during punching. 4. Use 1.25mm hole-punching pliers to punch the top and bottom smaller holes for the earring finding and the dangle. Punch holes along your straight line. Wipe off marker. 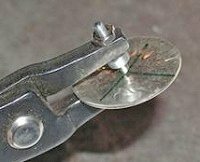 Tip: To make these holes equally distant from each edge of your disc, you can wrap a piece of scrap wire around the tip of your hole-punching pliers to serve as a gauge for distance. Tighten the wire with chain-nose pliers so it doesn’t slide off. 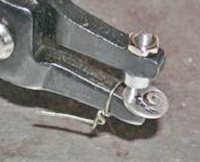 Editor’s note: You can also mark your pliers with a pen or for a secure removable option, wrap the spot with tape instead of wire. 5. Prepare your flower pieces by cutting off the existing rivet with flush cutters (if yours are riveted) and separating the pieces. Adjust the petals of the flowers as necessary to open them up. If you can’t find some that are already made, you can cut some out of 26- or 28-gauge sheet with a jeweler’s saw. 6. 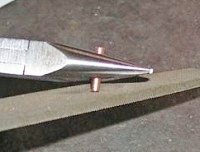 Using a flat file, file one end of a piece of 12-gauge copper wire perfectly flat. This step is imperative if you want your rivet to work. If the wire end is not flat, the wire will bend. Load your pieces on the wire in order, being sure to leave approximately 1/16″ excess wire on either side. Snip with flush cutters. Remove the pieces and file both ends flat. Test for flatness by trying to stand the wire on its own. 7. Load the components on the wire, and stand it up on the steel plate. Use the sharp end of a riveting hammer to rivet one side. Turn and lightly tap the piece a few taps, flip it over and repeat on the other side. Flipping and hammering evenly is key to a good rivet. Use the blunt, wider side of the riveting hammer to smooth out rivet marks on both surfaces of the rivet. It’s not vital that the rivet be very snug. It just needs to hold the pieces together. Bend the petals up with chain-nose pliers. 8. 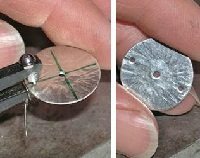 Stamp the 1/4″ sterling disc with a household hammer and design stamp. I position my stamp first with my eyes, knowing which is my desired top and bottom, leaving space for the hole at the top. Then I line up the stamp on an angle and look at its reflection on the metal. Give it one good tap. Darken the design with permanent black marker and then wipe off excess ink. 9. 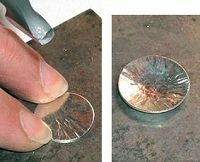 Use the 1.25 mm hole-punching pliers to punch a hole in the stamped disc. Tap the disc with a nylon or rawhide hammer to flatten it out if needed. 10. Cut two 3″ pieces of 20-gauge soft sterling wire. Bend a right angle in the wire at 1-3/4″. Create a wire loop and load the stamped disc onto the wire. Bend the tail loosely around the straight wire. 11. Bend another right angle in the wire to create another loop shape. Remember to load the dangle onto the riveted earring before you wrap the loop. Make another earring just like that one to complete the pair. 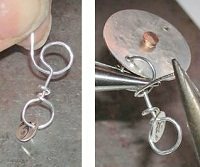 Then use Karen’s instructions for making unique ear wires to finish the earrings. 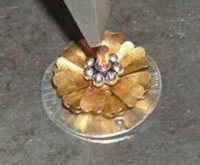 Once you’ve gotten comfortable layering and creating your own riveted or cold connected flower components, try your hand as this variation. 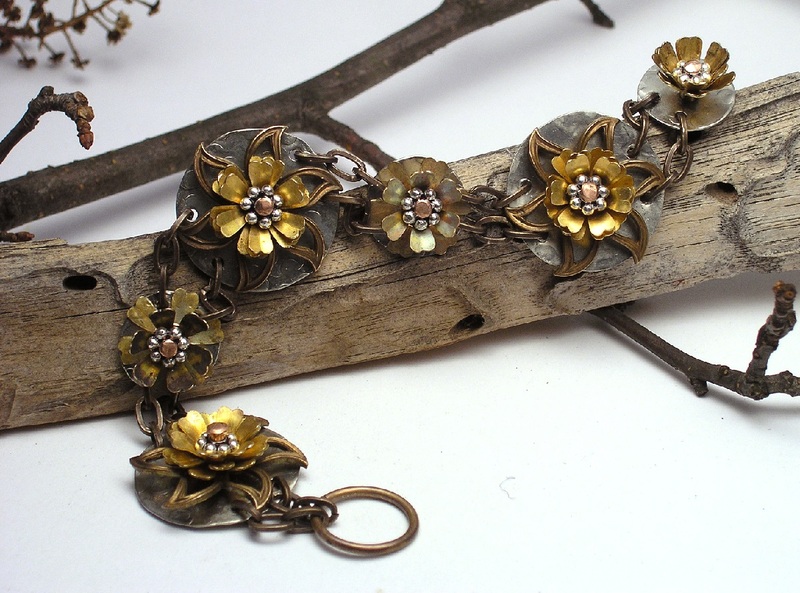 Karen connected flower components in various sizes with bits of chain and jump rings to create this bracelet. 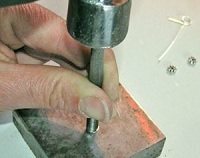 Want to learn more about jewelry making using cold connections? For 20 more cold-connected metal jewelry projects, get Karen’s book Metal Style: 20 Jewelry Designs with Cold Join Techniques. Cold connections are kind of addicting, aren’t they? Once we start making rivets, tabs, and other cold connections, we get hooked on finding more new and inventive ways to connect metal jewelry components without soldering. Master cold connections like riveting and more with these resources!